FLA run 2 yds, out of bounds. Die Marke 10:00 wurde erreicht und übertroffen, es steht also ein KW-Wechsel an. FLA pass 17 yds, FUMBLE! (Flag on the play!) FLA recover at BEA 33 and may advance. Was darf's denn sein, liebe Flash 80s? Penalty: Offside, Defense, 5 Yards. 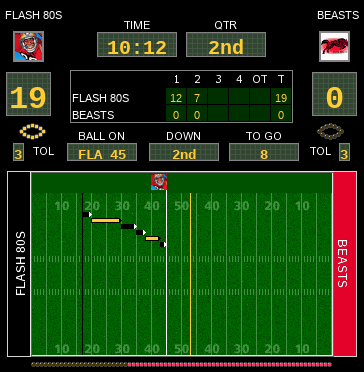 FLA pass 17 yds, FUMBLE! (Flag on the play!) FLA recover at BEA 33 and advance 33 yds for a TOUCHDOWN! FLA kickoff 61 yds to BEA 4, BEA return 23 yds to BEA 27. Kopf hoch! Noch ist das Spiel noch lange nicht aus!! BEA run -1 yd, fourth down. BEA punt 46 yds to FLA 28, FLA return 72 yds for a TOUCHDOWN! FLA kickoff 70 yds into the end zone, no return, touchback! So, ich bin dann mal für 10 Tage weg. Die Nordsee ruft.